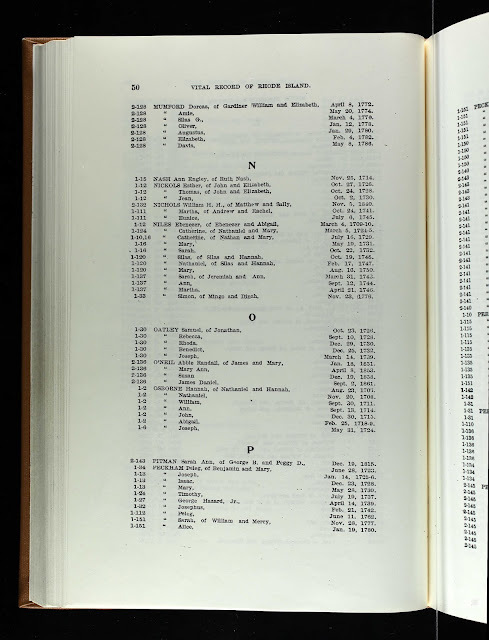 Genea-Musings: Treasure Chest Thursday - Post 327: 1732 Birth Record of Benedict Oatley in South Kingstown, R.I.
Treasure Chest Thursday - Post 327: 1732 Birth Record of Benedict Oatley in South Kingstown, R.I.
"Rhode Island, Vital Records Extracts, 1636-1899," indexed database and digital image, Ancestry.com (http://www.ancestry.com), Volume 5, "Washington County Births, Marriages and Deaths," South Kingstown, page 50, (image 170 of 523), Benedict Oatley birth entry. This book is a Derivative Source, with Primary Information and Direct Evidence of the name, birth date and birth place of Benedict Oatley and his siblings. This book refers to the South Kingstown town record book, which apparently has the births of the Oatley children in Volume 1, page 30. The first four children listed are by Jonathan Oatley's first wife, Deliverance LNU (1700-1734). The fifth child listed above, and another son who was not listed, and children of Jonathan's second wife, Mary LNU (1702-1786). Benedict Oatley (1732-1821) is my 5th great-grandfather. He married Elizabeth "Betsy" Ladd (1735-1814) in 1755, and they had seven children.